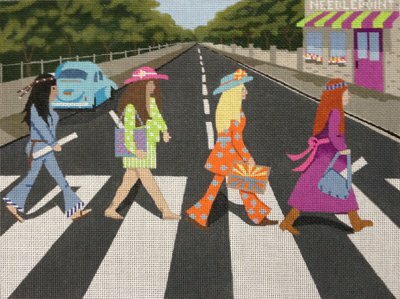 Take a stroll across Abbey Road with groupies in Needlemania by Purple Palm Needlepoint Designs. Needlemania is bright, colorful and fun to stitch. The design measures 9" x 12" and is handpainted on 18 mesh mono needlepoint canvas. The Needlemania canvas can be purchased with or without fibers. If you select cotton we will send DMC cotton floss. For wool we use Bella Lusso and for silk we use Pepper pot silk fibers which are single stranded and easy to use. If you want to hold the canvas taut on stretcher bars while you stitch it then we recommend a pair of 13" and a pair of 16" bars plus some thumb tacks.